An Abbe Museum collections mystery SOLVED! Way back in 1932, Maine folklorist Fannie Hardy Eckstorm published The Handicrafts of the Modern Indians of Maine, Abbe Museum Bulletin III (actually, in 1932 we were still the Lafayette National Park Museum, but that is another story…). 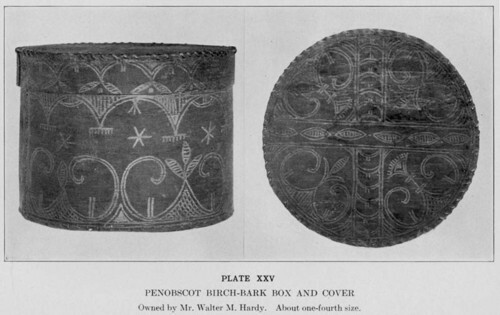 In this book she included a photo of a stunning birchbark box from the collection of Walter M. Hardy (her brother). Decades later in 2003 the Abbe reprinted Eckstorm’s book. We set out to get updated color photos of the pieces featured, but were unable to find this particular piece at the museums with similar collections we contacted. Another decade passed, and in 2012 we got an email from the Farnsworth Art Museum in Rockland, asking if we could tell them anything about a birchbark box they had in there collection, with a photo attached. It was the missing box! Which it turns out had not really been missing, but in the fine care of the Farnsworth since 1952. Another year passes, and we receive a letter from the Farnsworth, informing us that they had decided to deaccession the box (along with another, smaller but as lovely) and transfer them to the Abbe. In May 2014, the transfer happened, and the boxes are now in their new permanent home at the Abbe. 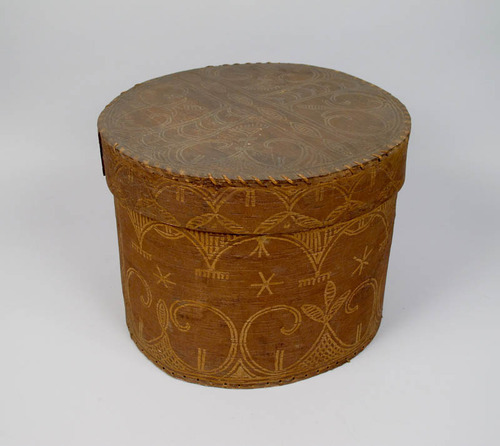 The box is thought to be Penobscot, and dates to sometime before 1840.